Clarifies role of community mobility in the Individual Education Plan. Review of the diagnoses and community mobility challenges that youth with a variety of diagnoses often experience. Screening tools to identify deficiencies in community mobility before transitioning out of school. 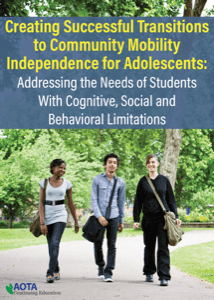 Concepts in therapeutic activities and methods to help practitioners develop student community mobility skills.